Facebook chatbots have changed the way consumers and brands interact on the world’s largest social platform. Today, over 100,000 bots are being used on Facebook Messenger to collect information, make product recommendations, take orders and even for social good. That’s why we are excited to announce that Sprout Social’s Bot Builder now supports the ability to set up, operate and manage chatbots within Facebook Messenger. Research shows that chatbots on Facebook Messenger can increase employee productivity by 3.5x. 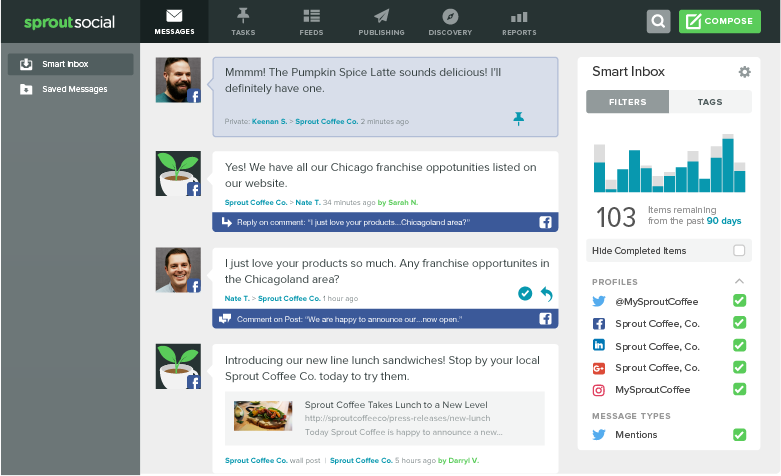 The potential impact for Sprout customers is immense, since the number of social messages needing a response from a brand increased by 18% from 2015 to 2016. 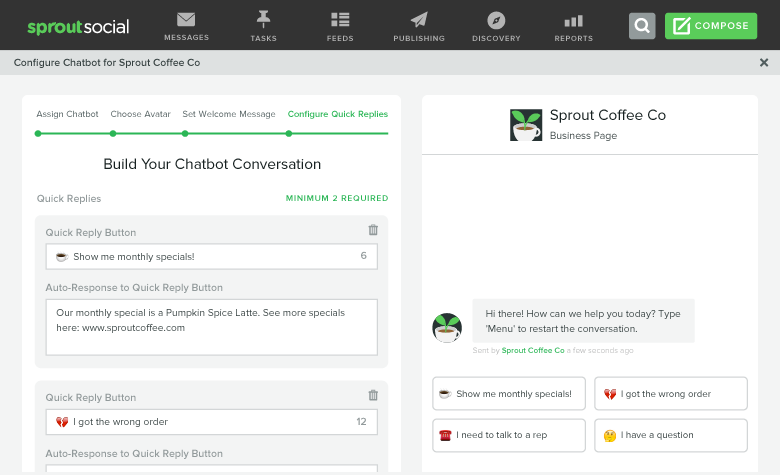 Sprout’s Bot Builder, included in Sprout’s Advanced plan, gives brands a scalable and affordable way to respond to more customers over Facebook Messenger. 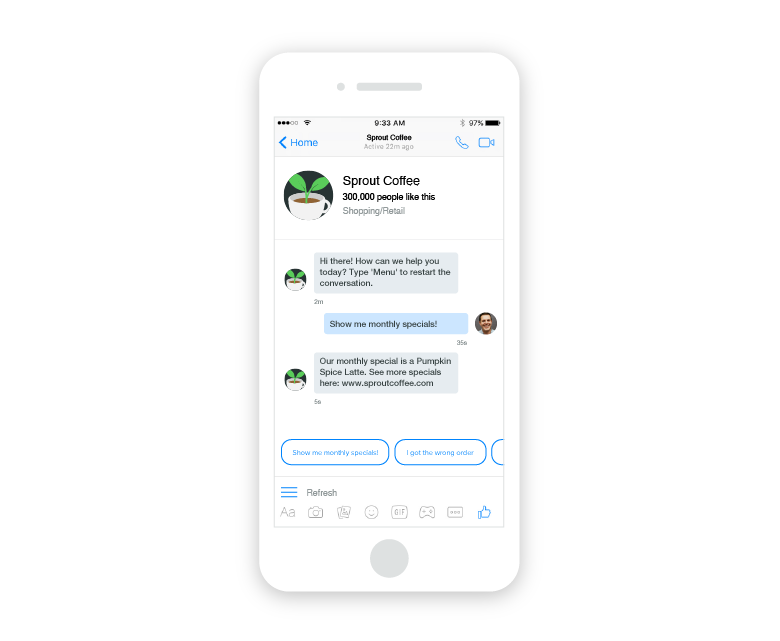 We recently launched Sprout’s Bot Builder for Twitter chatbots and we quickly found that many brands were using Twitter chatbots to automate repetitive tasks, mostly for customer support and marketing use cases. With Facebook Messenger, brands are approaching automation for similar use cases, and more specifically to deliver targeted content based on interests and to answer product or service related questions. Facebook Messenger chatbots have also opened up new pipelines for consideration and trial. When 1-800-Flowers launched chatbots on Facebook Messenger, they found that 70% of the company’s chatbot orders were from new customers. Using Sprout’s Bot Builder, an ecommerce company that receives a high-volume of product-related inquiries on Facebook Messenger can recommend products using Quick Replies and a corresponding Auto-Response. From there, they can easily lead customers to a website to purchase a specific item. By automating content flows, businesses can streamline customer interactions that could eventually result in new business opportunities. In addition to sharing content, brands can uncover new marketing opportunities when they use creative and engaging Quick Replies. Whether it’s to spread brand awareness or simply to entertain users, the conversational components can be customized to supplement an existing marketing campaign or lead customers through an interactive journey. Facebook Messenger introduces additional functionality to the chat experience that helps brands facilitate great volumes of chatbot conversations. Using a Restart Command and a Restart Button, users interacting with a chatbot have the ability to restart the conversation. When a user types a Restart Command such as “Menu” or “Refresh” or clicks the Restart Button located in the Persistent Menu, the initial Welcome Message and Quick Reply options resurface so that a user can continue interacting with the bot. This way, a brand can build out a more engaging experience that leads a user through a variety of fun and interesting responses as they interact with different Quick Replies. Facebook Messenger stands out from other chat platforms not only because of its wide reach, but also because it allows for conversations to be initiated on Messenger outside of a business’ Facebook Page. 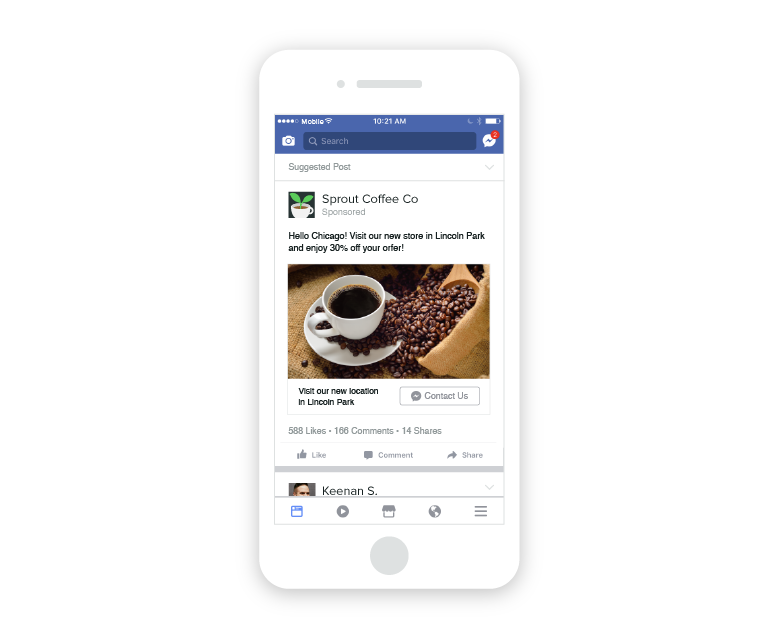 Using a plug-in, brands can embed a Messenger button on their website and into their Facebook ads to encourage more conversations. With this strategy, brands have a unique opportunity with chatbots. Any Facebook Messenger chatbot that is built and activated using Sprout’s Bot Builder will appear in every channel where Facebook Messenger is present, making it possible to automate experiences over various channels. Brands can complement their existing Messenger strategy—whether embedded on their website or the target of Facebook Ads—by introducing a chatbot to further scale customer engagement. Being able to effectively manage incoming messages is critical. Especially as message volumes increase and brands find more opportunities to converse with their customers. As users interact with Quick Replies and respond to your chatbot’s questions, all Private Messages will stream into the Smart Inbox. From here, your team can easily view, prioritize, assign and take action on incoming messages. In order to maintain focus only on the messages that require a response, you have the ability to auto-complete responses from chatbot interactions such as Quick Replies and Restart Command submissions. Facebook Messenger chatbots help brands optimize content flows and scale 1:1 engagement. All of the components you need to get started with chatbots can be easily configured and customized using Sprout’s Bot Builder. You can also read our complete guide to chatbots.